The ski stunt simulator is an online computer game with an interesting appeal. 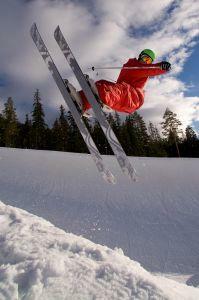 It is favored by physics enthusiasts and freestyle skiing wannabes. How did two totally different types of people come to enjoy the same type of game? The answer lies in the simulator's story. For those looking for an adventure from the safety of your home, try out this game and get ready for a challenge. You can play the game on co-creator Michiel de van Panne's website. However, while he encourages you to enjoy the online game, he advises against attempting these tricks on the slopes. Ski Jumping Pro from Vivid Games offers multiple difficulty levels and vivid 3D graphics. Get it on the App Store. Moby Games has the game available for download. Fun Motion features Ski Stunt Simulator Extreme. This game is a modified version of the original and gives players seven new levels, bigger jumps and more challenging terrain. To play the game you will need to download the zip file to your computer. The ski stunt simulator is a unique computer game that will allow you to mimic freestyle skiing. The player has control of the skier, which is mapped to the X and Y axis of the mouse. If you move the mouse up, the skier will straighten out. When you move it down, the skier crouches. Moving the mouse to the left and right will make the skier lean forward and backward. A combination these two axes will create an even wider range of motion. If you want to create a ski racer, hold the mouse in the bottom-right position. This will result in a classic skier's tuck position. Each limb of the ski character has the appropriate amount of inertia. To perform a "ski jump", start with the mouse toward the bottom of the screen and then quickly slide it up. To perform a "flip", begin in the lower-left corner and do an arc. The upwards motion will result in airtime. Then, move the mouse to the bottom-right to tuck into a rotation. The trick is to extend the skier's body to slow the rotation and time the landing, the same way you would if you were on the slopes. The ski simulator has 14 levels, and the skills and tricks required to pass each level will vary. For example, one level will require you to perform a back flip on a specific jump, while another will require the annoying task of clearing a stack of crates. Some might require you to simply make it to the bottom of the slope, dead or alive. The stunt simulator is the product of a unique collaboration between Cedric Lee, a programmer at Relic Entertainment and Michiel van de Panne, a researcher at the University of British Columbia. The game won First Place at the ACM International Programming Competition. The game was developed with the goal of capturing and analyzing the actual movements of freestyle skiing stunts. In fact, the "game" aspect of the simulator is just one of its functions. The researchers hope to eventually turn the stunt simulator into a sports prototyping tool. Given that the animations are confined to the logic of the Newtonian laws of physics, the simulator might one day be used to explore different movement options and skiing exercises. Even in its current state, the researchers saw the ski stunt simulator's potential as an online educational tool. They believed that the game lent itself to teaching concepts such as inertia, ground reaction forces, angular momentum and movement timing requirements. This game is perfect for those who want to experience the thrill of freestyle skiing without the danger associated with the sport. Whether you are an expert skier or never have put on a pair of skis, you will find the ski simulator challenging and fun.